I have been baptised ANTI and yes I am a real "Anti" in the true sense of being against many things, but furthermore and most of all I am SPECIAL. On the contrary I just love to return it loaded. Not at all, just bring it on. Why this, it is my speciality. Am I ANTI long pimples? What is on your mind, we are like siblings. Definitely not, sometimes I long for some proper workout. Don't be ANTI either, just try me and adopt me. ANTI SPECIAL is distinctively slower than our current Anti-Spin rubbers 'Gorilla' and 'Grizzly' and offer a much better control. On top of that the rubber produces a very good spin reversal for a highly effective blocking game close to the table. At the same time ANTI SPECIAL provides good attacking possibilities through aggressive pushing and lifting, especially on chopped balls. 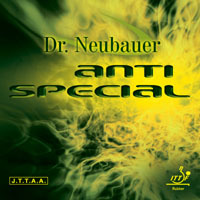 ANTI SPECIAL comes with a new rubber formula for the topsheet and a new type of sponge. This way the rubber is quite similar to our old frictionless long pimpled rubbers. The versions with 1.5 and 1.8mm are most effective for short blocking close to the table. The version with 1.2mm even provides a better control. It is also very effective however it is even more suitable for attacking. All three sponge thicknesses also provide a good control and a lot of effectiveness while defending.